Recent evidence of selective reporting of results has eroded public and academic confidence in publications of clinical trials, leading to renewed calls for trial registration.1–5 The dangers of non-disclosure of trial results, although described for years, sparked an international furore last spring after the publication of two systematic reviews on the effects of selective serotonin reuptake inhibitors for childhood depression.1 6 Subsequent legal proceedings7 and policy statements by journal editors,8 9 medical associations,10 and industry11 have recognised the importance of trial registration. The rationale for registering trials is well known (box 1).12 13 Most importantly, the contribution to social good that justifies research on human participants is not realised when resulting knowledge remains invisible. As an interested and neutral party that has been registering the trials that it funds,14 the Canadian Institutes of Health Research hosted an open meeting on 4 October 2004 in Ottawa, Canada, to foster international consensus on trial registration. The resulting Ottawa statement aims to establish internationally recognised principles for registration (box 2). The full statement is on bmj.com, but here we highlight and discuss some of the key principles. A statement on how to implement these principles (part 2) is still in development. Public release of registered information should occur, as a principle, at specific stages of a trial (figure). Sponsors, principal investigators, journals, and ethics committees all have certain responsibilities to ensure comprehensive registration of trials. Three of the key principles in the statement have been the subject of much debate, and we discuss the rationale behind them in more detail below. Some people have argued against requiring registration of early or post-marketing exploratory trials and uncontrolled trials, citing the need to protect commercial interests for interventions under development.11 15 Such trial designs may also be deemed less important for registration because they rank lower in the hierarchy of evidence to guide healthcare decisions. Furthermore, pharmaceutical companies have suggested restricting the registration of results to commercially available drugs because many researched drugs never make it to market and cannot affect healthcare. However, these arguments ignore the fundamental ethical obligations to research participants. Most importantly, the potential risks of their voluntary participation, which exist in any type of trial, are justified primarily by the presumed social good resulting from the creation of publicly accessible knowledge. This social contract to accurately disseminate information and results from all trials takes precedence over commercial or other interests. A decision not to bring an intervention to market—whether for economic or scientific reasons—does not invalidate this ethical obligation to participants and has little bearing on the importance of knowledge gained from trials. For example, information gained in early trials about an ineffective or harmful intervention that has not been marketed should be made publicly known to avoid unnecessary and potentially harmful duplication by other researchers. Several additional justifications exist for including all trials. Certain interventions and uncommon diseases are less amenable to controlled study designs. The best evidence for these interventions is thus limited to less rigorous designs such as prospective case series. Even so, information from exploratory and uncontrolled trials can be clinically important for generating future hypotheses and for documenting potential harms and preliminary efficacy data. Despite supporting registration of results from all hypothesis testing trials of market approved drugs, the pharmaceutical industry has offered to report results from early exploratory trials only if they are deemed to be medically important.11 15 This is, however, no different from what happens now with exploratory trials. The conflict between disclosure and commercial or other interests must be avoided by mandating registration for all trials on approved and unapproved interventions; voluntary disclosure is inherently subjective. Concerns have been raised over the public release of commercially sensitive information and intellectual property contained in trial protocols, such as trade secrets and novel methods or hypotheses. Competitors could use registered information to their advantage. Likewise, other academic researchers could use detailed protocol information to complete and publish a similar study earlier. However, details of the trial have to be publicly available before recruitment to fully inform potential participants about the nature of the study. Protection of trade secrets can be a legitimate concern, but detailed pipeline information on interventions and research from the preclinical phase to the market phase is already available through various subscription websites.16–18 Thus, public release of protocol information does not pose a new threat to commercial interests. Furthermore, specific details about an intervention's design properties need not necessarily be registered, so trade secrets would be uncompromised. With regards to protecting novel ideas, protocol registration will establish a form of intellectual property by publicly documenting methods and their date of registration. We now have the opportunity to shape the transition to a new framework of health research based on transparency, full disclosure, and collaboration. In the coming year, the evolving Ottawa Group (currently consisting of over 80 individuals and organisations from five continents) will continue to consult broadly about the most effective and practical ways to enact these principles in a coordinated fashion worldwide. Difficult decisions will have to be made related to timely and feasible implementation of the principles. Those who wish to contribute further to the Ottawa statement are invited to become involved (http://ottawagroup.ohri.ca/). The group will meet in Portland, US, on 22 May 2005 during the 26th annual meeting of the Society for Clinical Trials to discuss how these principles can be put into practice. 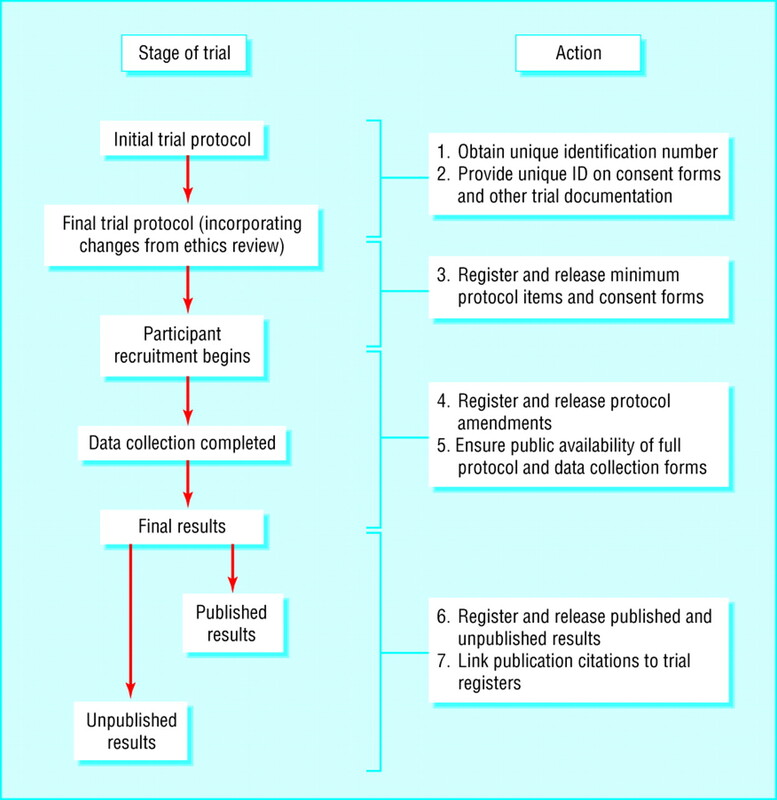 Already, a group assembled by the World Health Organisation to guide development of global trial registration23 has used an earlier draft of the statement to shape its plans. We encourage other stakeholders to do the same and contribute to public discussion of this important issue. We thank Mark Bisby, Isabelle Schmid, and Kathie Clark for their support of the Ottawa brainstorming meeting as well as David Moher, John Hoey, Doug Altman, Mike Clarke, Gerd Antes, David Bell, and Albert Clark for their helpful input into the preparation for the brainstorming meeting. We also thank Robbie Foy, Marie Hatem, Joanne Délage, Genevieve Dubois-Flynn, Iranga Chikuru, and Leanne Moussa for their invaluable recording contributions during the meeting. Contributors and sources All six authors participated in the October 2004 Ottawa brainstorming discussion, and worked through conference calls and email to plan, build consensus, and write and revise the Ottawa Statement. Ottawa Group members contributed feedback on multiple drafts of the statement. K K-J, A-WC, and KD formed the core group that carried the planning, writing and editing process forward, with K K-J taking the lead. .Selective serotonin reuptake inhibitors in childhood depression: systematic review of published versus unpublished data.Lancet2004; 363:1341–5. .Reporting of 6-month vs 12-month data in a clinical trial of celecoxib.JAMA2001; 286:2398–400. .Empirical evidence for selective reporting of outcomes in randomized trials: Comparison of protocols to published articles.JAMA2004; 291:2457–65. .Outcome reporting bias in randomized trials funded by the Canadian Institutes of Health Research.CMAJ2004; 171:735–40. .Identifying outcome reporting bias in randomised trials on PubMed: review of publications and survey of authors.BMJ2005; 330:753–6. .Efficacy and safety of antidepressants for children and adolescents.BMJ2004; 328:879–83. .GlaxoSmithKline faces US lawsuit over concealment of trial results.BMJ2004; 328:1395. .Compulsory registration of clinical trials.BMJ2004; 329:637–8. .Clinical trial registration: a statement from the International Committee of Medical Journal Editors.JAMA2004; 292:1363–4. .Influence of funding source on outcome, validity, and reliability of pharmaceutical research. 2004.www.ama-assn.org/ama/pub/category/14314.html (accessed 30 Mar 2005). .Joint position on the disclosure of clinical trial information via clinical trial registries and databases, 2005. www.ifpma.org/Documents/NR2205/joint%20position_clinical%20trials.PDF (accessed 30 Mar 2005). .Trial registration; a great idea switches from ignored to irresistible.JAMA2004; 292:1359–62. .Registering CIHR-funded randomized controlled trials: a global public good.CMAJ2004; 171:750–1. .Principles on conduct of clinical trials and communication of clinical trial results.PRMA,2004.www.phrma.org/publications/policy/admin/2004-09-07.1059.pdf (accessed 30 Mar 2005). Biospace Clinical Competitive Intelligence System. www.biospace.com/ccis/ccis_subscribe.cfm (accessed 23 Mar 2005). Pharmaprojects. www.pjbpubs.com/pharmaprojects/index.htm (accessed 23 Mar 2005). Recombinant Capital. http://www.recap.com/ (accessed 23 Mar 2005). .How useful are unpublished data from the Food and Drug Administration in meta-analysis?J Clin Epidemiol2003; 56:44–51. .Should unpublished data be included in meta-analyses? Current convictions and controversies.JAMA1993; 269:2749–53. .Effects of editorial peer review: a systematic review.JAMA2002; 287:2784–6. .Bias, subjectivity, chance, and conflict of interest in editorial decisions. In: Godlee F, Jefferson T, eds. Peer review in health sciences. 2nd ed. London:BMJ Books,2003:91–117. .Registering clinical trials: an essential role for WHO.Lancet2004; 363:1413–4.